It could be that your cat acquired the common scratch disease known as Bartonella. It appears that 20% of cats living in the US carry this disease. It is acquired by cats coming in contact with flea feces. If your cat has a history of flea infestation, feces left on the skin of the cat can develop this disease. Symptoms include swollen glands, oral or corneal ulcers, fewer, diarrhea, inflammatory bowel disease, and muscle aches. A simple blood test is available to diagnose the disease. Suggested remedies include keeping your cat free of fleas and ticks. 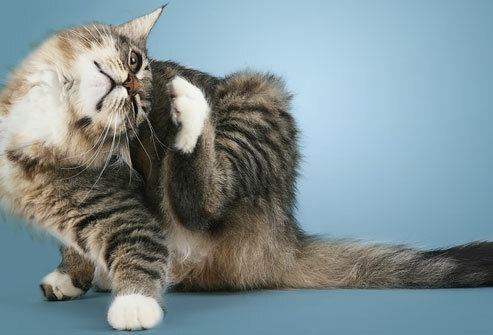 Avoid any scratch or bites during treatment for fleas and ticks. Avoid rough play with cats and keep their nails groomed. There is no vaccine available for the disease at this time. This disease can be acquired by humans from contact with the infected cats. Human symptoms include fatigue, redness of the area contacted, loss of appetite, mild fever, chills, nausea and inflammation of eyelids. The treatment of the disease includes cleansing of the wound area, bed rest, and avoidance of contact with cats. Keep your house and vehicles free of fleas and ticks to avoid the spread of the disease.